This event is co-sponsored by the Center for Human Rights and Global Justice; the Robert L. Bernstein Institute for Human Rights; the Center on Race, Inequality, and the Law; Law Students for Human Rights; and Law Students for Economic Justice. 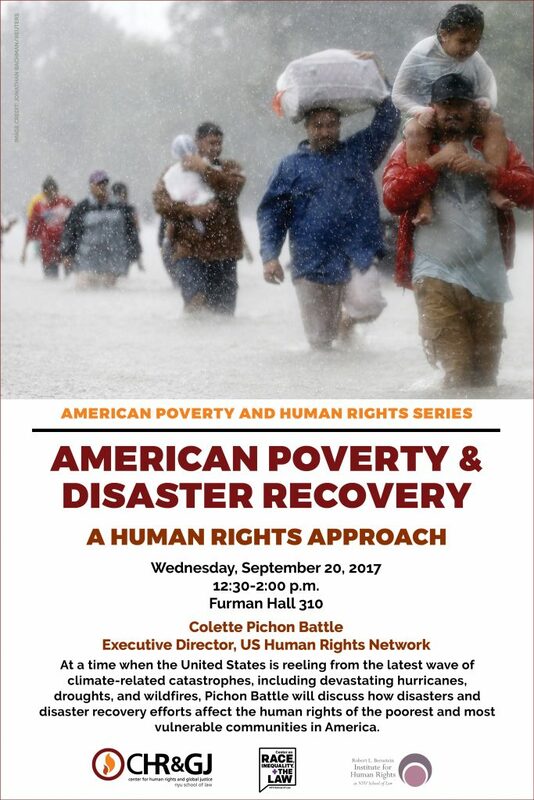 At a time when the United States is reeling from the latest wave of climate-related catastrophes, including devastating hurricanes, droughts, and wildfires, Pichon Battle will discuss how disasters and disaster recovery efforts affect the human rights of the poorest and most vulnerable communities in America. How does generational and structural poverty affect people’s exposure to and experience of disaster? What will be the long-term poverty impacts, including among disproportionately affected communities of color? What would it mean to take a human rights-based approach to disaster recovery, and to focus on equity as a key to building more resilient communities? Colette Pichon Battle is an attorney, Louisiana native, climate justice activist, racial justice advocate, and the Executive Director of the US Human Rights Network, headquartered in Atlanta. Before her position at USHRN, Colette served as the Executive Director of the Gulf Coast Center for Law & Policy where she designed and oversaw programming focused on Global Migration, Community Economic Development, Climate Justice and Equitable Disaster Recovery. For the past decade, Pichon Battle has worked with local communities, elected officials and national organizations to build multi-racial, cross-regional alliances to promote equity in the Gulf Coast’s recovery following Hurricane Katrina and the BP oil spill. She is a 2016 White House Champion of Change for Climate Equity, a 2015 Echoing Green Climate Fellow, as well as the recipient of a U.S. Civilian Medal of Honor for the state of Louisiana for her work in the post-Katrina Gulf Coast. She received her Bachelor of Arts degree in International Studies from Kenyon College and her Juris Doctor from Southern University Law Center.